Fundus photo and fluorescein angiogram of a classic choroidal neovascular membrane in exudative age-related macular degeneration. Age-related macular degeneration (ARMD) is an acquired degeneration of the retina that causes significant central visual impairment through a combination of non-neovascular (drusen and retinal pigment epithelium abnormalities), and neovascular derangement (choroidal neovascular membrane formation). Advanced disease may involve focal areas of retinal pigment epithelium (RPE) loss, subretinal or sub-RPE hemorrhage or serous fluid, as well as subretinal fibrosis. A genetic underpinning is inferred from its predilection to those of European ancestry, although environmental, nutritional, and developmental (ie., aging) processes interact to affect the degeneration observed in the macula. Newly implicated biochemical pathways combined with a paucity of treatment options for the majority of ARMD (i.e.,dry ARMD) has created fertile ground for novel therapeutics. Drusen and disciform lesions have been observed in conjunction for well over 100 years. The hallmark of age-related macular degeneration is the presence of drusen within the macula. The word druse (singular) is derived from the German word for potato stone or geode. Early ARMD: Defined by the presence of numerous small (<63 microns, “hard”) or intermediate (≥63 microns but <125 microns, “soft”) drusen. Note: Small drusen are frequently seen in those 50 and older, and can represent an epiphenomenon of aging (therefore, intermediate drusen are more specific for ARMD). 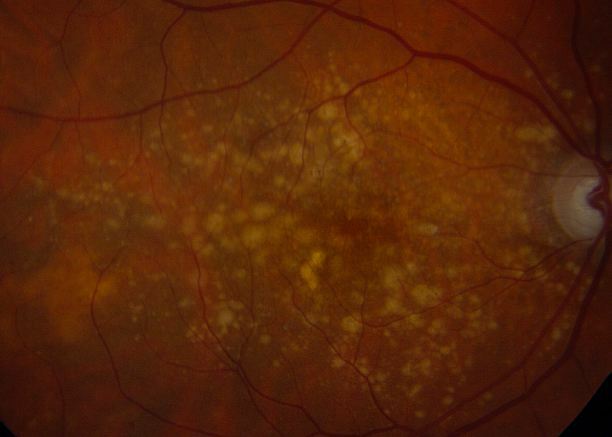 Intermediate ARMD: Macular disease characterized by either extensive drusen of small or intermediate size, or any drusen of large size (≥125 microns). 124 micron is the average diameter of retinal vein at the optic disc margin. Advanced ARMD: Defined by the presence of either geographic atrophy or choroidal neovascular membrane (along with its sequelae, such as subretinal or sub-RPE hemorrhage or serous fluid, and subretinal fibrosis). The figure below demonstrates progressive geographic atrophy over a 29-month period. There is also an area of choroidal neovascularization along the inferior aspect of the scar with subretinal fibrosis that progresses over these 29 months. The costs of ARMD to society and the patient have been divided into direct costs (direct ophthalmologic cost and direct non-ophthalmogic cost) and indirect costs. Direct ophthalmologic costs include the cost of treatments (AREDS, intravitreal injections, laser treatment, diagnostic imaging, etc.). Direct non-ophthalmologic costs include special services and equipment such as rehabilitation services, low vision aids and transportation services. Measurement of these costs are more diffcult and less pervasive in the literature. Indirect costs include lost productivity and workplace costs. The annual loss of GDP due to neovascular ARMD in one study was calculated to be $5.396 billion, and $24.395 billion for nonneovascular ARMD. A combination of risk factors interplay to modify the Bruch's membrane/choroid complex, the retinal pigment epithelium and photoreceptor cells. The initiating events affect one, both, or all of these tissue components. A change in one of these tissue components is thought to impart an influence on the others in such a way that an 'intermediate disease mechanism” arises. The degenerating retina succumbs to the final end point of geographic atrophy, choroidal neovascularization and pigment epithelial detachment. Treatments targeting intermediate disease mechanisms or initiating disease factors are in the minority, but may offer a more successful approach to vision preservation than those targeting relatively later steps in ARMD pathophysiology (i.e., choroidal neovascularization). The prevalence of advanced ARMD in the Beaver Dam Eye Study was 1.6%, with the exudative form being present in one eye 1.2% of the time, and geographic atrophy in one eye 0.6% of the time. This population represented 4,926 people between the ages of 43 to 86 years of age. Similar prevalence data was noted in the Framingham Eye Study, which reported a prevalence of exudative ARMD in those older than 52 years of age of 1.5%. The prevalence of age-related macular degeneration sharply increases in those 75 years or older. ARMD risk increases with age. The risk increases more than three-fold in patients older than 75 years of age compared to the group of patients between 65-74 years of age (Beaver Dam Eye Study; Framingham Eye Study). A ten pack-year tobacco smoking history is associated with increased development of exudative age-related macular degeneration. After controlling for confounding factors such as socioeconomic status, alcohol consumption and cardiovascular disease, the rates of visually significant ARMD in smokers and non-smokers over the age of 75 were calculated in an United Kingdom population-based cross sectional study. Current smokers were twice as likely to have ARMD-related vision loss when compared to non-smokers, ex-smokers had a slightly increased risk (odds ratio of 1.13), and those who had stopped smoking over 20 years earlier were not at increased risk for developing vision loss from ARMD. In addition to increasing one's risk of developing ARMD, certain genetic loci have been associated with variable effects on treatment response, such as intravitreal anti-VEGF agents. Complement factor H (CFH) is an important gene in the pathogenesis of ARMD. Pharmacogenomic studies, such as these, may guide treatment regimens in the future, or may at least provide a more accurate prediction of treatment response. Recently, microRNA dysregulation has been linked with the development of ARMD, modulation of which could provide potential treatments for the disease. Normal aging changes can be observed in the outer retina, RPE, Bruch’s membrane, and choriocapillaris, and many of these changes are difficult to separate from those seen in ARMD. In many instances, the designation of normal and abnormal has simply not been established to date. Furthermore, since aging is perhaps one of the most important risk factors for age-related macular degeneration, the physiological changes in aging may mirror the pathophysiological changes in age-related macular degeneration. Cumulative oxidative injury likely underlies changes seen in both aging and ARMD, for example. With age, within the outer retina, the photoreceptors become reduced in density. Within the RPE, melanin granules diminish, and lipofuscin granules form. Sheet-like deposits called basal laminar deposits develop below the RPE but above Bruch’s membrane (basal lamina of the RPE). Within the choriocapillaris, involutional changes are observed. Decreased choroidal blood flow, lumen diameter and choriocapillaris number also occur with aging. Scant, small, hard drusen alone cannot be pathognomonic for age-related macular degeneration, as focal deposition of acellular debris between the RPE and Bruch's membrane is found frequently in aged individuals, and is a normal finding in aging. Age-related drusen, however, are biochemically distinct from drusen associated with ARMD. Large, confluent, or soft drusen are more likely to be a marker of age-related macular degeneration than normal aging. Drusen are a hallmark of ARMD. On histopathology, nodular drusen appear as eosinophilic dome-shaped structures situated between Bruch's membrane and the displaced, attenuated RPE overlying the drusen. Drusen display dense PAS-positivity. They may become more basophilic with accumulation of calcium. Von Kossa staining may reveal calcific granules or calcific stippling within such calcified drusen. Soft or large drusen may occur with the development of localized detachments of basal laminar or basal linear deposits, which represent granular material accumulating between either the RPE and its basement membrane or external to the RPE's basement membrane, respectively. The size and density of drusen are determinant factors in the progression of the disease. On histopathology, serous RPE detachments can be associated with thickening of the inner aspect of Bruch's membrane. Histopathologically, RPE atrophy may be associated with depigmentation, migration and proliferation of RPE cells into the photoreceptor layer. With progression, RPE degeneration is seen, with loss of adjacent photoreceptors, and juxtaposition of Bruch's membrane to the inner nuclear layer. Sub-RPE neovascularization is located within Bruch's membrane, typically between the thickened inner aspect of Bruch's membrane and the rest of Bruch's membrane. A sub-RPE neovascular membrane can extend subretinally in areas where Bruch's membrane is not intact. With discontinuities in Bruch's membrane, capillary-like choroidal vessels can form a subretinal RPE vascular web that can affect serous or hemorrhagic detachments of the neurosensory retina. Fibrous disciform scars are usually results of sub-RPE neovascularization. Fibrous tissue develops within Bruch's membrane or between the RPE and retina. Hemosiderin is typically present, suggesting a hemorrhagic antecedent event. RPE hyperplasia may be a prominent feature of disciform scarring, and lymphocytic infiltrate in the adjacent choroid is occasionally appreciated. Overlying retina undergoes cystic degeneration with photoreceptor loss. Biochemical pathways and genetic association studies have shed light on the possible biochemical pathways that go awry in ARMD. Two polymorphisms, Tyr402His at 10q26 (Complement factor H locus), and Ala69Ser (LOC387715) may be responsible for up to 50-75% of the genetic risk of ARMD. One caveat of these risk alleles is that they have not been validated in racial groups other than Caucasians. Aside from explaining some of the genetic predisposition in ARMD, these loci have uncovered new biochemical pathways hitherto unlinked to ARMD pathogenesis, providing novel therapeutic targets. Pathway-based treatment modalities targeting oxidative damage, lipofuscin accumulation, inflammation, and derangements in complement activation are rapidly proliferating. The following list represents the biochemical pathways implicated in ARMD pathogenesis and the corresponding genetic loci involved. The complement system is a three-pronged pathway involved in natural and acquired immunity. It represents a highly regulated conglomeration of approximately 30 proteins, some of which are cell surface receptors, while others possess catalytic activity. The three prongs of the pathway include the classical, the alternative, and the lectin pathways. The classical pathway depends on activation by antigen-antibody complexes, the lectin pathway, on carbohydrate residues, and the alternative pathway depends on spontaneous activation. Complement activity may increase in response to surface features on microorganisms. Components in cigarette smoke may also trigger this activity. Activation of the complement system results in cellular damage that is central in the pathogenesis of dry and wet forms of ARMD, and this is supported by the presence of many complement system proteins within drusen in patients with ARMD. The alternative pathway becomes activated through a process known as "tickover.” Under normal circumstances, proteins expressed on host cells inhibit this tickover process, and in so doing prevent injury to the host. Instances where this inhibition is jeopardized is when factors favoring activation increase locally (or systemically), inhibitors decrease (or their function decreases), or when there is an increased local concentration of alternative pathway components. Therefore, there needs to be active, continuous control over the alternative pathway to avoid autologous tissue destruction. In ARMD, it is believed that an early "seeding event," such as an area of retinal pigment epithelium atrophy with cellular debris, induces innate immune system activation at the RPE-choroid-Bruch's membrane complex. Subsequently, complement attack (membrane attack complex activation) leads to collateral damage of retinal tissue. This damage predisposes to geographic atrophy and choroidal neovascular membrane formation. In 2005, four groups independently reported that a polymorphism at amino acid position 402 of factor H is associated with ARMD. Factor H is the main soluble inhibitor of the alternative complement pathway. Mutation in factor H in the same region where the polymorphism is encountered has been associated with type II membranoproliferative glomerulonephritis, a condition wherein drusen also develop. Smoking cessation, reduction in body mass index, and treatment of hypertension are modifiable risk factors that should be addressed in patients at risk for, or who have various stages of ARMD. Based on population based cross sectional studies, the prevalence of ARMD in ex-smokers is less than in smokers, arguing for a possible benefit of smoking cessation on societal ARMD disease burden. Studies on the beneficial effect of dietary antioxidants and omega 3 fatty acids on prevention of AMD have yielded insufficient results. The diagnosis of early ARMD is typically made after considering a patient's age, physical exam findings, and family history, as many patients in early stages of the disease possess no symptoms. Decreased central visual acuity may not be present in ARMD, especially in early stages, and is not a reliable indicator of disease severity. In fact, advanced ARMD may be associated with relatively preserved visual acuity (see time lapse fundus photograph above, where a patient had 20/40 vision despite advanced ARMD). Exudative ARMD changes may be associated with acute to subacute drops in vision, or perception of visual distortion such as metamorphopsia. Periodic dilated fundus exams are warranted to identify patients who progress to neovascular ARMD without having symptoms. The Preferential Hyperacuity Perimeter (PreView PHP, Carl Zeiss Meditec, Dublin, CA/ ForeseeHome) is useful, when available, to identify new-onset neovascular ARMD changes. Dry ARMD constitutes 85-90% cases of ARMD, and usually does not cause severe vision loss. Wer AMD constiutes 10-15% of ARMD cases and is the major cause of severe vision loss. The hallmark findings in nonexudative ARMD are drusen, RPE changes, and geographic atrophy. In advanced ARMD, drusen may fade or become resorbed in areas of geographic atrophy. Large areas of geographic atrophy may show prominent deep choroidal vessels with atrophy of the choriocapillaris. Fluorescein angiography and optical coherence tomography are useful in evaluating for the presence of exudative ARMD. Fluorescein angiography is performed when there is suspicion for choroidal neovascular membrane (CNVM) formation. ARMD pathology on fluorescein angiography can be organized into hyperfluorescent changes and hypofluorescent changes. Changes in ARMD that cause hypofluorescent changes are few, and include hemorrhage, lipid exudation, and pigment hyperplasia. Causes of hyperfluorescent lesions are more numerous, and include drusen, RPE atrophy (transmission defects), choroidal neovascular membranes, serous pigment epithelial detachments, and subretinal fibrosis or scars (staining defects). Choroidal neovascular membranes can present differently on angiography. Two main designations are 'classic' vs. 'occult.' Fluorescein angioraphic features help distinguish classic choroidal neovascularization and occult choroidal neovascularization. Differences in angiographic patterns are thought to arise from 'classic' lesions penetrating the retinal pigment epithelium, and thus being located in front of the RPE, and 'occult' lesions being sub-RPE. Classic membranes are associated with an early hyperfluorescent area that is well-demarcated, which increases in intensity and extent beyond the early phase boundary by mid- to late-frames. Pooling of fluorescein associated with a concomittant subsensory retinal detachment may also be appreciated. Occult membranes are presumed when late choroidal leakage is noted without a discernible classic membrane pattern. Occult membranes are also presumed when a fibrovascular pigment epithelial detachment (FVPED) is suspected. FVPEDs are associated with irregular RPE elevation, and a stippled hyperfluorsescent pattern with or without leakage or pooling. a.- Fibrovascular pigment epithelial detachment- Better appreciated with stereoscopic views. At 1-2 minutes, there is an irregular elevation of the RPE with stippled or granular hyperfluorescence . As time passes, the boundary may or may not show leakage. The margin of FVPED may be apparent in around 1-2 minutes of the FFA or the margin may be difficult to ascertain in some cases. Late leakage of an undetermined source- In early or mid phase, there is no well-defined area of hyperfluorescence like what is seen with classic CNVM or FVPED. The leakage is usually deep/choroidal or at the RPE and late associated with speckled appearance and pooling of dye in the subretinal space overlying the speckles. Optical coherence tomography (OCT) offers a non-invasive, high-resolution, optical cross-sectional method that utilized low-coherence interferometry. OCT has become indispensable in the evaluation of patients with ARMD. Imaging helps evaluate for tomographic sequelae of neovascular membranes, as well as monitor for treatment responses. No routine blood tests are available to diagnose ARMD, and although elevated inflammatory markers (e.g., CRP) and certain genetic polymorphisms have been associated with increased risk of developing advanced ARMD, these tests are not routinely employed. The differential diagnosis of age-related macular degeneration varies greatly depending on whether choroidal neovascularization is present or not, so it is useful to organize the differential into "nonexudative" vs. "exudative" ARMD. Exudative ARMD: The differential diagnosis of neovascular ARMD includes choroidal neovascularization caused by conditions other than ARMD, such as ocular histoplasmosis syndrome, pathlogic myopia, chroidal rupture, angioid streaks, or idiopathic causes. In addition, foveal detachments or vitelliform detachments may complicate other conditions, such as cuticular drusen, or pattern dystrophies. The latter would not be associated with leakage on fluorescein angiography, but rather progressive staining of vitelliform material. Polypoidal choroidal vasculopathy may produce hemorrhagic PEDs that can resemble those in ARMD, but the absence of drusen, the often peripapillary location of such lesions, and the better visual acuity outcomes of polypoidal vasculopathy help distinguish it from ARMD. Choroidal tumors obscured by subretinal hemorrhage or RPE changes may also masquerade for exudative ARMD, but unilaterality and ultrasonography should help distinguish a tumor from ARMD. Central serous retinopathy is an important differential especially of occult CNVM. Nonexudative ARMD: The differential diagnosis of nonneovascular ARMD includes retinal pigment epithelial changes secondary to central serous chorioretinopathy (CSC), pattern dystrophy, cuticular drusen, and drug toxicity (e.g., chloroquine toxicity). These conditions overlap with the various pathological changes observed in dry ARMD, but either occur in a younger patient population, or are missing key ARMD features, such as drusen. For example, CSC may present with multiple serous PEDs and RPE changes, but not drusen. Pattern dystrophy usually affects patients younger in age than ARMD, and has a fluorescein angiography pattern that is distinct, with early blocked fluorescence with surrounding hyperfluorescence, and late staining of the vitelliform material. Observation with risk factor modification and nutritional supplementation is the mainstay of treatment for nonexudative ARMD. Exudative ARMD is managed with more closely spaced examinations and intravitreal injections of anti-VEGF agents or laser treatments. Patients with advanced disease in both eyes should undergo evaluation and rehabilitation with low-vision services. In AREDS2, lutein/zeaxanthin or DHA/EPA had no additional effect on the risk of advanced AMD. Study participants who took AREDS containing lutein/zeaxanthin and no beta-carotene had a slight reduction in the risk of advanced AMD, compared to those who took AREDS with beta-carotene and no lutein/zeaxanthin. Importantly, former smokers who took AREDS with beta-carotene had a higher incidence of lung cancer. Lower zinc oxide doses (25mg) did not significantly increase the risk of advanced AMD, although a trend to more protection from advanced AMD was noted with higher zinc oxide doses (80mg). Newer formulations replace beta-carotene with lutein/zeaxanthin, but keep the zinc oxide dose the same. Studies performed in the 1980's assessed the efficacy of laser photocoagulation in limiting damage caused by choroidal neovacular lesions. These studies evaluated laser treatment of extrafoveal, juxtafoveal, and subfoveal neovascular membranes. Patients with direct laser photocoagulation to extrafoveal or juxtafoveal sites fared better than those receiving direct laser to subfoveal membranes. While severe vision loss was averted, laser photocoagulation currently has limited utility because of its high recurrence rates, risk of inducing vision loss (especially with subfoveal membranes), and failure to affect an improvement in vision from baseline visual acuity. In the era of anti-VEGF therapies, the indications for direct photocoagulation are diminishing. However, it may be considered in extrafoveal small CNVM. Use of photosensitizers (e.g., verteporfin) that pool in neovascular membranes and subsequently prodice reactive oxygen species upon activation with light of a specific wavelength was introduced in the late 1990's. In the era of anti-VEGF therapies, the indications for photodynamic therapy are diminishing. 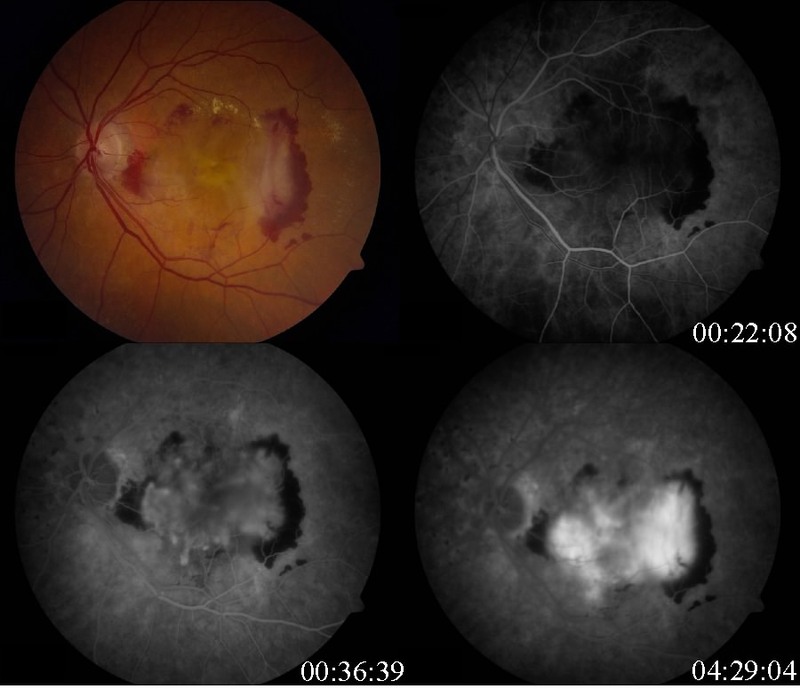 Optical coherence tomography and anti-vascular endothelial growth factor (VEGF) therapy together have revolutionized the treatment of exudative ARMD. Ranabizumab (Lucentis, Genentech, San Francisco, CA), Bevacizumab (Avastin, Genentech, San Francisco, CA), and more recently, Aflibercept (Eylea, Regeneron Pharmaceuticals Inc., Tarrytown, NY), are frequently used in the treatment of exudative ARMD. Pegaptanib (Macugen, Pfizer) was the first anti-VEGF therapy to recieive FDA approval for the treatment of ARMD in 2004. It is biochemically distinct from subsequent anti-VEGF agents, in that it represents an aptamer as opposed to a monoclonal antibody (bevacizumab), monoclonal antibody fragment (ranabizumab), or a receptor-antibody fusion protein (aflibercept, see diagram below). Pegaptanib is a small oligonucleic acid molecule that binds specifically to the VEGF-165 isoform. Radiotherapy has been used in neovascular ARMD under the premise that radiation can inhibit the exhuberant cellular proliferation necessary to create the choroidal neovascular membrane. However, studies on efficacy have not shown a clear benefit of this treatment modality. Treatments targeting biochemical pathways implicated in the pathophysiology of ARMD are being tested actively in clinical trials. Agents currently undergoing evaluation in geographic atrophy /advanced AMD are listed in the table below. Treatments include small inhibitory RNA molecules, monoclonal antibodies, inhibitors of G-protein coupled receptors, anti-inflammatory medications, antioxidants, and cell-based therapies. Information for the following table was retrieved from http://clinicaltrials.gov on 10/2016. Subretinal hemorrhage can cause photoreceptor damage as the blood is in contact with the photoreceptors and early treatment is needed. Subretinal hemorrhage may be of varying severity. Massive subretinal hemorrhages are typically thought to be associated with anticoagulation therapy, specifically, warfarin therapy. Surgical management options has been reviewed elsewhere (Management of Submacular Hemorrhage). Break-through vitreous hemorrhage secondary to neovascular ARMD is a rare complication. Sudden peripheral visual field and central vision loss is noted in these instances, to be distinguished from the central field complaints typically noted with ARMD. Other etiologies, such as retinal tears from hemorrhagic posterior vitreous detachments, retinal vascular diseases such as diabetic retinopathy or vein occlusions should be considered as well. Diplopia can occur as a result of the choroidal neovascular membrane "dragging" the fovea. Such patients present with central binocular diplopia in the presence of peripheral fusion. This syndrome is referred to as dragged-fovea diplopia syndrome, and is usually addressed with some form of partial monocular occlusion (Scotch Satin tape). Severe central vision loss leading to legal blindness (Visual acuity less than 20/200) is an endpoint more frequently seen in neovascular ARMD compared to nonneovascular ARMD. Based on data from the Framingham Eye Study and a case-control study by Hyman et al., the proportions of neovascular and nonneovascular ARMD in patients legally blind in an eye from advanced ARMD were compared. 79% to 90% of legal blindness in advanced ARMD was associated with neovascular, and not nonneovascular disease. Boyd K, Janigian RH. Age-Related Macular Degeneration. American Academy of Ophthalmology. EyeSmart® Eye health. https://www.aao.org/eye-health/diseases/age-related-macular-degeneration. Accessed March 07, 2019. Porter D, Vemulakonda GA. Drusen. American Academy of Ophthalmology. EyeSmart® Eye health. https://www.aao.org/eye-health/diseases/drusen-list. Accessed March 08, 2019. Turbert D, Janigian RH. Avastin. American Academy of Ophthalmology. EyeSmart® Eye health. https://www.aao.org/eye-health/drugs/avastin-list. Accessed March 18, 2019. Turbert D, Janigian RH. Lucentis. American Academy of Ophthalmology. EyeSmart® Eye health. https://www.aao.org/eye-health/drugs/lucentis-list. Accessed March 18, 2019. Turbert D,Vemulakonda GA. Eylea. American Academy of Ophthalmology. EyeSmart® Eye health. https://www.aao.org/eye-health/drugs/eylea-list. Accessed March 18, 2019. Turbert D,Vemulakonda GA. Anti-VEGF Treatments. American Academy of Ophthalmology. EyeSmart® Eye health. https://www.aao.org/eye-health/drugs/anti-vegf-treatments-list. Accessed March 18, 2019. The Age-Related Eye Disease Study 2 (AREDS2) Research Group. JAMA. 2013;309(19):2005-2015. doi:10.1001/jama.2013.4997. American Academy of Ophthalmology. Retina/Vitreous: Age-related macular degeneration Practicing Ophthalmologists Learning System, 2017 - 2019 San Francisco: American Academy of Ophthalmology, 2017. ↑ Hutchinson J, Tay W. Symmetrical central chorio-retinal disease occurring in senile persons. Roy Lond Ophthalmol Hosp Rep 1875; 83:275. ↑ Klein R, Klein BEk, Linton KLP (1992). Prevalence of Age-related Maculopathy-The Beaver Dam Eye Study. Ophthalmology 99(6): 933-943. ↑ Coleman HR, Chan CC, Ferris FL III, Chew EY. Age-related macular degeneratio. 2008. Lancet 372(9652):1835-1845. ↑ 7.0 7.1 7.2 7.3 7.4 7.5 7.6 Gupta OP, Brown GC, Brown MM (2007) Age-related macular degeneration: the costs to society and the patient. Curr Opin Ophthalmol 18:201-205. ↑ Gupta OP, Brown GC, Brown MM (2007) Age-related macular degeneration: the costs to society and the patient. Curr Opin Ophthalmol 18:201-205. ↑ Brown MM, Brown GC, Stein JD, et al (2005). Age-related macular degeneration: economic burden and value-vased medicine analysis. Can J Ophthalmol 40:277-287. ↑ Klein R, Klein BEK, Linton KLP (1991). Prevalence of age-related maculopathy: The Beaver Dam Eye Study. Ophthalmology 99: 933-943. ↑ Leibowitz Hm, Krueger DE, Maunder LR, et al (1980) The Framingham Eye Study Monograph. Surv Ophthalmol 24:335-610. ↑ Clemons TE, Milton RC, Klein R, Sedon JM, Ferris FL III (2005). Risk factors for the incidence of advanced age-related macular degeneration in the Age-Related Eye Disease Study (AREDS): AREDS report no. 19. Ophthalmology 112:533-539. ↑ Khan JC, Thurlby DA, Shahid H, Clayton DG, Yates JR, Bradley M, Moore AT, Bird AC (2006). Smoking and age-related macular degeneration: the number of pack years of cigarete smoking is a major determinant of risk for both geographic atrophy and choroidal neovascularization. Br J Ophthalmol 90:75-80. ↑ Evans JR, Fletcher AE, Wormald RPL (2005). 28,000 Cases of age related macular degeneration causing visual loss in people aged 75 years and above in the United Kingdom may be attributable to smoking. Br J Ophthalmol 89: 550-553. ↑ Smailhodzic D, Muether PS, Chen J, Kwestro A, Zhang AY, Omar A, Johannes PHV, Keunen JEE, Kirchhof B, Yoyng CB, Klevering BJ, Koenekoop RK, Fauser S, den Hollander AI (2012). Cumulative Effect of Risk Alleles in CFH, ARMS2, and VEGFA on the Response to Ranibizumab Treatment in Age-Related Macular Degeneration. Ophthalmology (in press). p 1-8. ↑ Berber, P., Grassmann, F., Kiel, C. and Weber, B.H., 2016. An Eye on Age-Related Macular Degeneration: The Role of MicroRNAs in Disease Pathology. Molecular Diagnosis & Therapy, pp.1-13. ↑ Friedman, D. S., Katz, J., Bressler, N. M., Rahmani, B., & Tielsch, J. M. (1999). Racial differences in the prevalence of age-related macular degeneration: The Baltimore eye survey. Ophthalmology, 106(6), 1049-1055. ↑ Sandberg MA, Tolentino Mj, Miller S, Berson El, Gaudio AR. (1993) Hyperopia and neovascularization in age-related macular degeneration. Ophthalmology 100: 1009-113. ↑ Guymer R, Bird AC. Chapter 59. Age Changes in Bruch's Membrane and Related Structures. Retina, 4th Ed (2006). Volume II Schahcat AP, Ryan SJ. Elsevier Mosby. ↑ Zarbin MA 2004. Current concepts in the pathogenesis of age-related macular degeneration. Arch Ophthalmology 122:598-614. ↑ Jager RD, Mieler WF, Miller JW (2008). Age-Related Macular Degeneration. N Engl J Med 358;24: 2606-2617. ↑ Crabb JW, Miyagi M, Gu X, et al. Drusen proteome analysis: an approach to the etiology of age-related macular degeneration. Proc Natl Acad Sci U S A. 2002; 99:3842-3847. ↑ Bressler NM, Bressler SB, West SK, Fine SL, Taylor HR. 1989. The Grading and Prevalence of Macular Degeneration in Chesapeake Bay Waterman. Archives of Ophthalmology 107: 847-852. ↑ Green W.R. 1996. Ophthalmic Pathology, Volume 2, Chapter 9-Retina, pp 982-1047 W.B. Saunders Company. ↑ Davis MD, Gangnon RE,Lee L-Y, Hubbard LD, Klein BEK, Klein R et al. The Age-Related Eye Disease Study severity scale for age-related macular degeneration: AREDS Report No. 17. Arch Ophthalmol 2005; 123(11): 1484–1498. ↑ Shaw, P. X., Stiles, T., Douglas, C., Ho, D., Fan, W., Du, H., & Xiao, X. (2016). Oxidative stress, innate immunity, and age-related macular degeneration. AIMS molecular science, 3(2), 196. ↑ Zarbin MA, Rosenfeld PJ (2010). Pathway-based therapies for age-related macular degeneration. Retina 30(9):1350-1368. ↑ B Gold, JE Merriam, J Zernant, LS Hancox, AJ Taiber, K Gehrs, K Cramer, J Neel, J Bergeron, GR Barile, RT Smith, AMD Genetics Clincal Study Group, GS Hageman, M Dean, R Allikmets. Variation in factor B (BF) and complement component 2 (C2) genes is associated with age-related macular degeneration. Nat. Genet. 38:458-462 (2006). ↑ JB Maller, JA Fagerness, RC Reynolds, BM Neale, MJ Daly, JM Seddon. Variation in complement factor 3 is associated with risk of age-related macular degeneration. Nat. Genet. 39:1200-1201 (2007). ↑ JRW Yates, T Sepp, BK Matharu, JC Khan, DA Thurlby, H Shahid, DG Clayton, C Hayward, J Morgan, AF Wright, AM Armbrecht, B Dhillon, IJ Deary, E Redmond, AC Bird, AT Moore, The Genetic Factors in AMD Study Group. Complement C3 variant and the risk of age-related macular degeneration. N. Engl. J. Med. 357:553-561 (2007). ↑ JL Haines, MA Hauser, S Schmidt, WK Scott, LM Olson, P Gallins, KL Spencer, SY Kwan, M Noureddine, JR Gilbert, N Schnetz-Boutaud, A Agarwal, EA Postel, MA Pericak-Vance. Complement factor H variant increases the risk of age-related macular degeneration. Science 308:419-421 (2005). ↑ RJ Klein, C Zeiss, EY Chew, J-Y Tsai, RS Sackler, C Haynes, AK Henning, JP SanGiovanni, SM Mane, ST Mayne, MB Bracken, FL Ferris, J Ott, C Barnstable, J Hoh. Complement factor H polymorphism in age-related macular degeneration. Science 308:385-389 (2005). ↑ AO Edwards, R Ritter III, KJ Abel, A Manning, C Panhuysen, LA Farrer. Complement factor H polymorphism and age-related macular degeneration. Science 308:421-424 (2005). ↑ Wang Q, Zhao H-S, Li L. Association between complement factor I gene polymorphisms and the risk of age-related macular degeneration: a meta-analysis of literature. Int J of Ophthalmol 2016; 9(2): 298–305. ↑ EM Stone, TA Braun, SR Russell, MH Kuehn, AJ Lotery, PA Moore, CG Eastman, TL Casavant, VC Sheffield. Missense variations in the fibulin 5 gene and age-related macular degeneration. N. Engl. J. Med. 351:346-353 (2004). ↑ ML Klein, DW Schultz, A Edwards, TC Matise, K Rust, CB Berselli, K Trzupek, RG Weleber, J Ott, MK Wirtz, TS Acott. Age-related macular degeneration. Clinical features in a large family and linkage to chromosome 1q. Arch. Ophthalmol. 116:1082-1088 (1998). ↑ DW Schultz, ML Klein, AJ Humpert, CW Luzier, V Persun, M Schain, A Mahan, C Runckel, M Cassera, V Vittal, TM Doyle, TM Martin, RG Weleber, PJ Francis, TS Acott. Analysis of the ARMD1 locus: Evidence that a mutation in HEMICENTIN-1 is associated with age-related macular degeneration in a large family. Hum. Mol. Genet. 12:3315-3123 (2003). ↑ Z Yang, C Stratton, PJ Francis, ME Kleinman, PL Tan, D Gibbs, Z Tong, H Chen, R Constantine, X Yang, Y Chen, J Zeng, L Davey, X Ma, VS Hau, C Wang, J Harmon, J Buehler, E Pearson, S Patel, Y Kaminoh, S Watkins, L Luo, et al. Toll-like receptor 3 and geographic atrophy in age-related macular degeneration. N. Engl. J. Med. 359:1456-1463 (2008b). ↑ AO Edwards, A Swaroop, JM Seddon. Geographic atrophy in age-related macular degeneration and TLR3. N. Engl. J. Med. 360:2254-2255 (2009). ↑ R Allikmets, AA Bergen, M Dean, RH Guymer, GS Hageman, CC Klaver, K Stefansson, BH Weber, Int. Age-Related Macular Degeneration Genetics Consortium. Geographic atrophy in age-related macular degeneration and TLR3. N. Engl. J. Med. 360:2252-2254 (2009). ↑ S Zareparsi, M Buraczynska, KEH Branham, S Shah, D Eng, M Li, H Pawar, BM Yashar, SE Moroi, PR Lichter, HR Petty, JE Richards, GR Abecasis, VM Elner, A Swaroop. Toll-like receptor 4 variant D299G is associated with susceptibility to age-related macular degeneration. Hum. Mol. Genet. 14:1449-1455 (2005a). ↑ AO Edwards, D Chen, BL Fridley, KM James, Y Wu, G Abecasis, A Swaroop, M Othman, K Branham, SK Iyengar, TA Sivakumaran, R Klein, BE Klein, N Tosakulwong. Toll-like receptor polymorphisms and age-related macular degeneration. Invest. Ophthalmol. Vis. Sci. 49:1652-1659 (2008). ↑ Z Yang, NJ Camp, H Sun, Z Tong, D Gibbs, DJ Cameron, H Chen, Y Zhao, E Pearson, X Li, J Chien, A DeWan, J Harmon, PS Bernstein, V Shridhar, NA Zabriskie, J Hoh, K Howes, K Zhang. A variant of the HTRA1 gene increases susceptibility to age-related macular degeneration. Science 314:992-993 (2006). ↑ A DeWan, M Liu, S Hartman, SS-M Zhang, DTL Liu, C Zhao, POS Tam, WM Chan, DSC Lam, M Snyder, C Barnstable, CP Pang, J Hoh. HTRA1 promoter polymorphism in wet age-related macular degeneration. Science 314:989-992 (2006). ↑ J Tuo, B Ning, CM Bojanowski, Z-N Lin, RJ Ross, GF Reed, D Shen, X Jiao, M Zhou, EY Chew, FF Kadlubar, C-C Chan. Synergic effect of polymorphisms in ERCC6 5' flanking region and complement factor H on age-related macular degeneration predisposition. Proc. Natl. Acad. Sci. USA 103:9256-9261 (2006). ↑ Q-L Wang, S Chen, N Esumi, PK Swain, HS Haines, G Peng, BM Melia, I McIntosh, JR Heckenlively, SG Jacobson, EM Stone, A Swaroop, DJ Zack. QRX, a novel homeobox gene, modulates photoreceptor gene expression. Hum. Mol. Genet. 13:1025-1040 (2004). ↑ R Allikmets, NF Shroyer, N Singh, JM Seddon, RA Lewis, PS Bernstein, A Peiffer, NA Zabriskie, Y Li, A Hutchinson, M Dean, JR Lupski, M Leppert. Mutation of the stargardt disease gene (ABCR) in age-related macular degeneration. Science 277:1805-1807 (1997). ↑ R Allikmets, N Singh, H Sun, NF Shroyer, A Hutchinson, A Chidambaram, B Gerrard, L Baird, D Stauffer, A Peiffer, A Rattner, P Smallwood, Y Li, KL Anderson, A Lewis, J Nathans, M Leppert, M Dean, JR Lupski. A photoreceptor cell-specific ATP-binding transporter gene (ABCR) is mutated in recessive Stargardt macular dystrophy. Nat. Genet. 15:236-246 (1997a). ↑ J Kaplan, S Gerber, D Larget-Piet, J-M Rozet, H Dollfus, J-L Dufier, S Odent, A Postel-Vinay, N Janin, M-L Briard, J Frézal, A Munnich. A gene for Stargardt's disease (fundus flavimaculatus) maps to the short arm of chromosome 1. Nat. Genet. 5:308-311 (1993). ↑ R Allikmets. Simple and complex ABCR: genetic predisposition to retinal disease. Am. J. Hum. Genet. 67:793-799 (2000). ↑ J Jakobsdottir, YP Conley, DE Weeks, TS Mah, RE Ferrell, MB Gorin. Susceptibility genes for age-related maculopathy on chromosome 10q26. Am. J. Hum. Genet. 77:389-407 (2005). ↑ A Rivera, SA Fisher, LG Fritsche, CN Keilhauer, P Lichtner, T Meitinger, BHF Weber. Hypothetical LOC387715 is a second major susceptibility gene for age-related macular degeneration contributing independently from complement factor H to disease risk. Hum. Mol. Genet. 14:3227-3236 (2005). ↑ Thurman and Holers (2006). The Central Role of the Alternative Complement Pathway in Human Disease. Journal of Immunology 176(3): 1305-1310. ↑ Klein, R. J., C. Zeiss, E. Y. Chew, J. Y. Tsai, R. S. Sackler, C. Haynes, A. K. Henning, J. P. SanGiovanni, S. M. Mane, S. T. Mayne, et al 2005. Complement factor H polymorphism in age-related macular degeneration. Science 308: 385-389. ↑ Edwards, A. O., R. Ritter, 3rd, K. J. Abel, A. Manning, C. Panhuysen, L. A. Farrer. 2005. Complement factor H polymorphism and age-related macular degeneration. Science 308: 421-424. ↑ Haines, J. L., M. A. Hauser, S. Schmidt, W. K. Scott, L. M. Olson, P. Gallins, K. L. Spencer, S. Y. Kwan, M. Noureddine, J. R. Gilbert, et al 2005. Complement factor H variant increases the risk of age-related macular degeneration. Science 308: 419-421. ↑ Hageman GS, Anderson DH, Johnson LV, Hancox LS, Taiber AJ, Hardisty LI. et al. A common haplotype in the complement regulatory gene factor H (HF1/CFH) predisposes individuals to age-related macular degeneration. Proc Natl Acad Sci U S A. 2005;102(20):7227–32. ↑ Chong, E.W., Wong, T.Y., Kreis, A.J., Simpson, J.A. and Guymer, R.H., 2007. Dietary antioxidants and primary prevention of age related macular degeneration: systematic review and meta-analysis. Bmj, 335(7623), p.755. ↑ Chong, Elaine WT, Andreas J. Kreis, Tien Y. Wong, Julie A. Simpson, and Robyn H. Guymer. "Dietary ω-3 fatty acid and fish intake in the primary prevention of age-related macular degeneration: a systematic review and meta-analysis." Archives of ophthalmology 126, no. 6 (2008): 826-833. ↑ Bresller NM, Bressler SB, Fine SL. Chapter 61. Neovascular (Exudative) Age-Related Macular Degeneration in Retina, Volume II, 4th Edition. Elsevier, Mosby. 2006. Editor: Andrew SP. Schachat. ↑ Bressler SB, Do DV, Bressler NM. Age-related macular degeneration: drusen and geographic atrophy. In: Albert DM, Miller JW, Azar DT, Blodi BA, eds. Albert and Jakobiec's Principles and Practice of Ophthalmology. 3rd ed. Philadelphia: Saunders; 2008: ch. 144. ↑ Lim LS, Mitchell P, Seddon JM, Holz FG, Wong TY (2012). Age-related macular degeneration. The Lancet 379:1728-1738. ↑ Huang D, Swanson EA, Lin CP, Shuman JS, Stinson WG, Chang W, Hee MR, Flotte T, Gregory K, Puliafito CA, et al. 1991. Optical coherence tomography. Science 254 (5035): 1178-1181. ↑ Yannuzzi LA, Wong DW, Sforzolini BS, et al. Polypoidal choroidal vasculopathy and neovascularized age-related macular degeneration. ARch Ophthalmol. 1999; 117: 1503-1510. ↑ Bresller NM, Bressler SB, Sarks SH, Sarks JP. Chapter 60. Age-Related Macular Degeneration: Nonneovascular Early AMD, Intermediate AMD, and Geographic Atrophy, Volume II, 4th Edition. Elsevier, Mosby. 2006. Editor: Andrew SP. Schachat. ↑ Scripsema, N.K., Hu, D.N. and Rosen, R.B., 2015. Lutein, Zeaxanthin, and meso-Zeaxanthin in the Clinical Management of Eye Disease. Journal of ophthalmology, 2015. ↑ Macular Photocoagulation Study Group (1986). Argon laser photocoagulation for senile macular degeneration. Results of a randomized clinical trial. Arch Ophthalmol 1982 100: 912-18. ↑ Macular Photocoagulation Study Group (1982). Argon laser photocoagulation for senile macular degeneration. Three-year results from randomized clinical trial. Arch Ophthalmol 104:694-701. ↑ Meleth AD, Wong WT, Chew EY (2011). Treatment for atrophic macular degeneration. Curr Opin Ophthal 22: 190-193. ↑ De Pool ME, Campbell JP, Broome SO, Guyton DL.fckLRSource (2005). The dragged-fovea diplopia syndrome: clinical characteristics, diagnosis, and treatment. Ophthalmology 112(8): 1455-62. ↑ Leibowitz HM, Krueger, Maunder LR, et al: The Framingham Eye Study Monograph. Survey Ophthalmology 1980: 24:335-610. ↑ Hyman LG, Lilienfeld AM, Ferris FL III, et al (1983) Senile macular degeneration: A case-control study. American Journal of Epidemiology 118:213-227. ↑ Ferris FL III, Fine SL, Hyman L (1984). Age-Related Macular degeneration and Blindness due to Neovascular Maculopathy. Arch Ophthalmol 102: 1640-1642. This page was last modified on April 8, 2019, at 14:59. This page has been accessed 278,619 times.